I have been using a lot of web tools to widen my reader scope and to increase my web hits. Pingomatic.com is one of them. 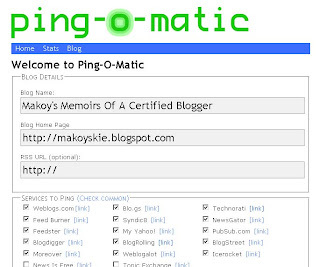 It works like a pinging device that informs search engines and blog directories that you have updated your blog. In just a single click, your blog update would be broadcasted to major sites. You can even bookmark the result page for easy access every time you have an update to be pinged. Cool huh!